2015 was a year that frustrated many, as the sp'500 largely traded with a narrow 5% range of 2000-2100. Mainstream consensus was pretty bullish at the start of 2015, with many seeking the 2200/2300s. Yet with a brief, but powerful drop to 1867 in August, anyone seeking the 2130s or higher by year end saw their outlooks completely trashed. 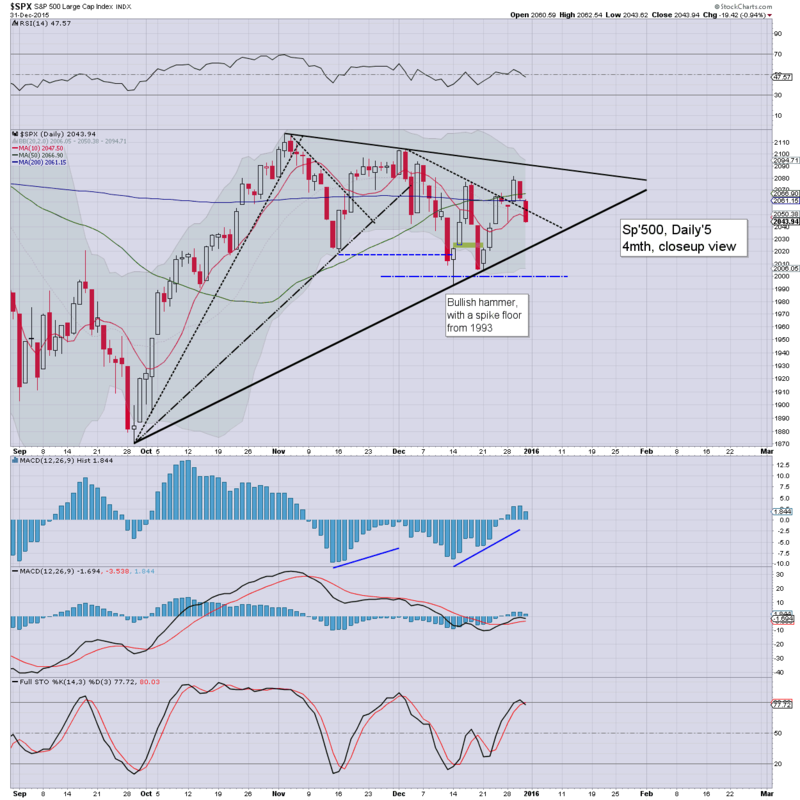 My original outlook was predicated on the Fed initially raising rates between March-May. 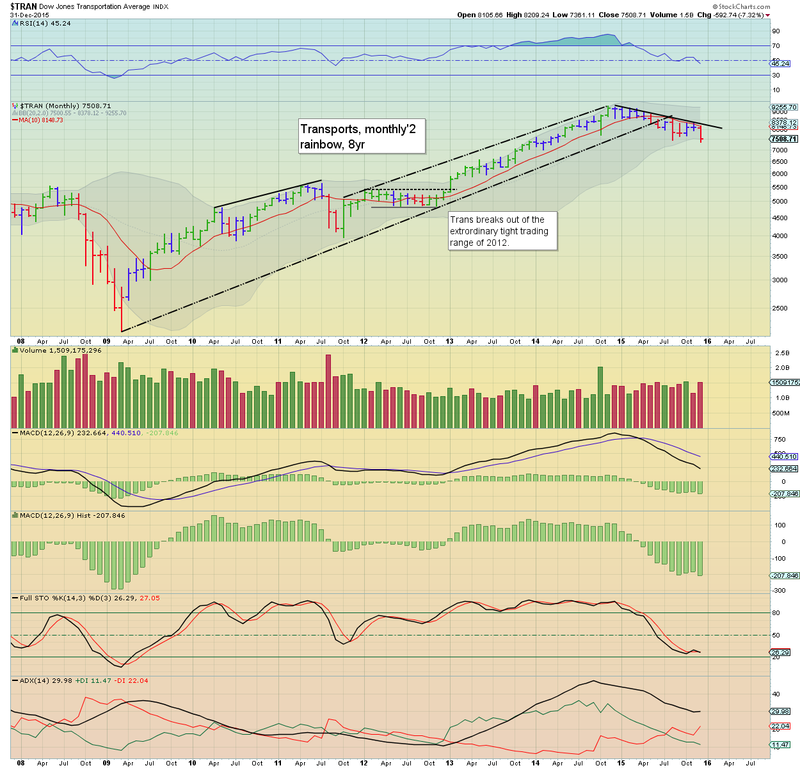 Although that did not occur, the market did manage to break a marginal new historic high of sp'2134.72 on May 20th. 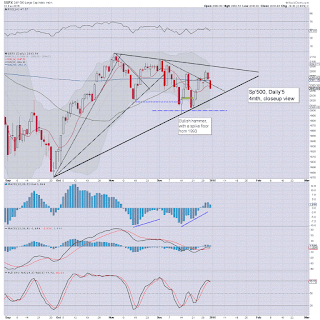 It remains my view that the market became increasingly stressed in the summer as the Fed continued to hold back. Once July/early Aug' earnings were out of the way, the market snapped lower (lead by INTC, AAPL, and DIS), and collapsed from 2103 to 1867 across just 5 trading days. I would agree a prime catalyst was China changing their exchange rate, but that the underlying pressure for a downside break had been building for many months. When the 200dma (2078) was broken under, the market was effectively in free fall, coming rather close to the Oct'2014 low (1820). 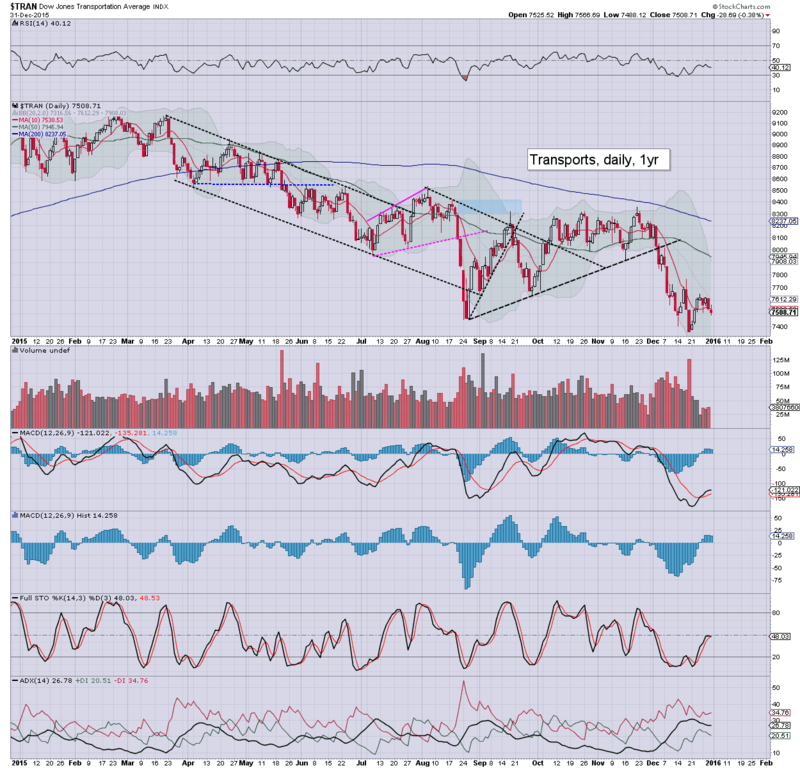 Notably, the Transports broke decisively below its Oct'2014 low. 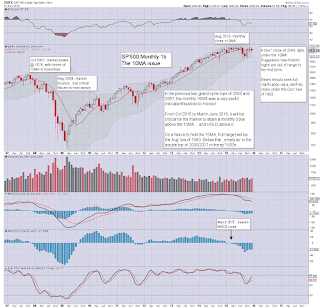 From Aug'24th onward, price action/structure was very much in the style of Oct/Nov' 2011. I would agree 2575 was a crazy number to begin with, but even consensus had been seeking the 2300s. Had the Fed raised rates in the spring, we'd likely not have had the Aug/Sept' washout, and we'd probably be in the 2300/400s. The much more interesting outlooks were from YOU ! A fair few of you sought year end closes in the 1700-1900s. 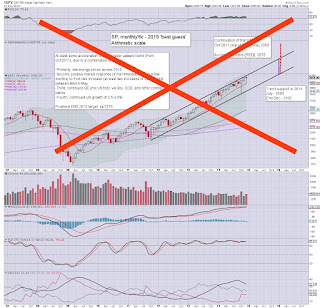 Clearly, that was way too bearish, as the US economy did not fall into recession. Closest to the year end close of sp'2043.94 was none other than poster 'Vinnie' - 1970, a mere 73.94pts (3.6%) away. Way to go Vinnie! I think many should give your future guesses some extra attention/respect. I certainly will. 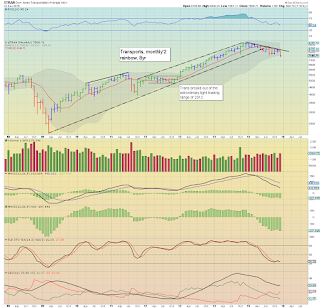 Then there were the overly bullish outlooks, not least by yours truly. 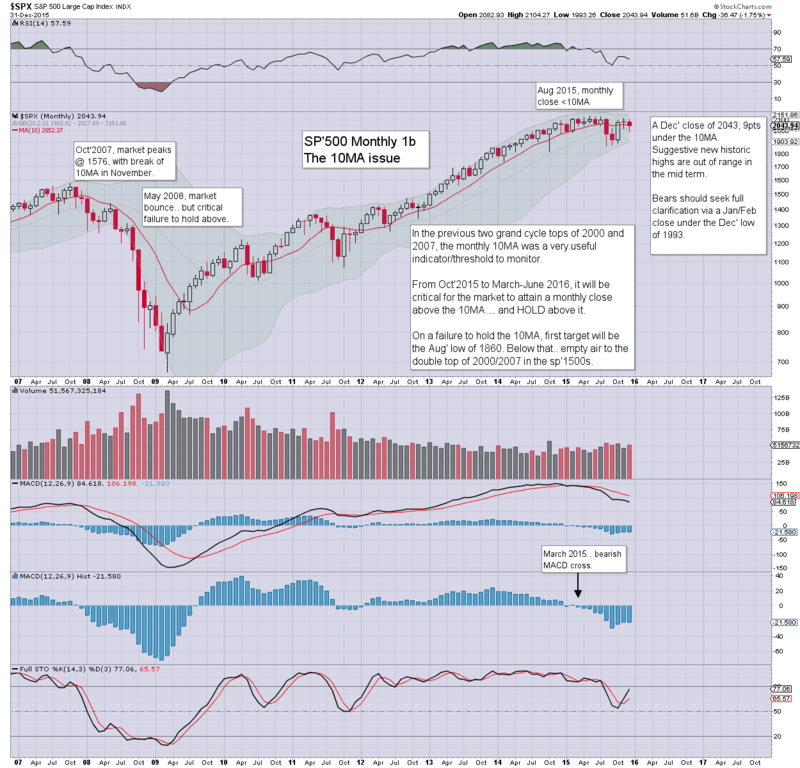 Indeed, anyone seeking anything above sp'2100 saw their outlook wrecked in August. 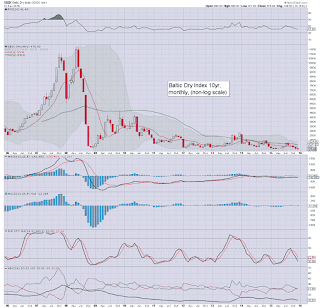 The lowest target was by Sowal Blackbear, who was looking to money velocity and the Baltic Dry Index as super bearish indicators. 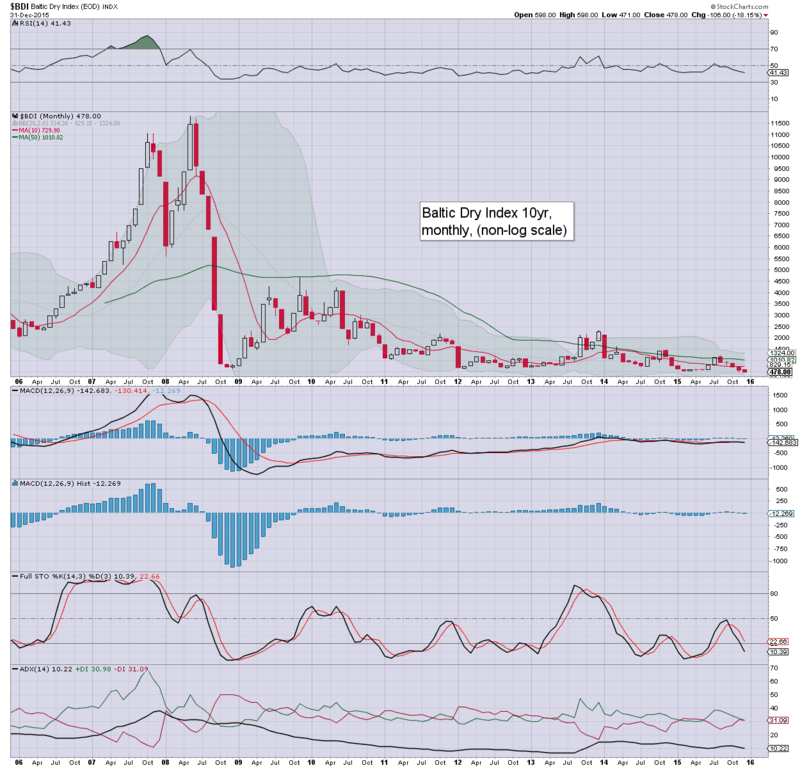 Notably, the BDI broke below the 2008 low this year to 471. M2 velocity did indeed continue to decline, now at just 1.49, the lowest level since records began in 1959. It could be argued the BDI is not necessarily indicative of world trade, as it is simply a measure of shipping costs, and there are simply more ships than necessary to meet current global demand. Money velocity is a major issue, and for the economists out there, issues of cash hoarding, or simply money sitting on computer drives in giant server basements, remains something that the Fed and national governments are still battling against. Oil did indeed decline from a 2014 close of $53.71, to a new multi-year low of $34.53. Considering that the supply issue is completely unresolved, a break <$30 looks entirely likely in 2016. 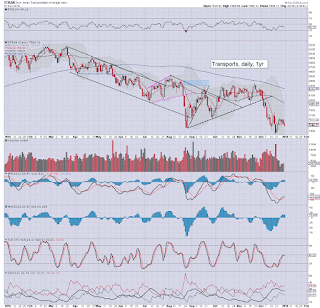 That will no doubt wreck any sustained upside in energy stocks, and put downward pressure on the broader market. As for Gold, it hit $1045 just recently, and that is close enough to $1k that I'd call a valid hit as well. Certainly, the gold bugs continue to tout nonsense, and I'd argue there is yet to be capitulation within the mining industry. I have always believed its important to listen and read around as much as possible, and especially for those things which we might be biased against. Even those who might have been completely wrong on an index target, often had some good predictions on a given commodity, or broader economic trend. From 'Sowal Blackbear's guess of 980 to yours truly @ 2575, I'd like to think everyone offered something of worth. Don't forget to submit your best guess/comments for what might be ahead next year. Sincerely.... good wishes for 2016. 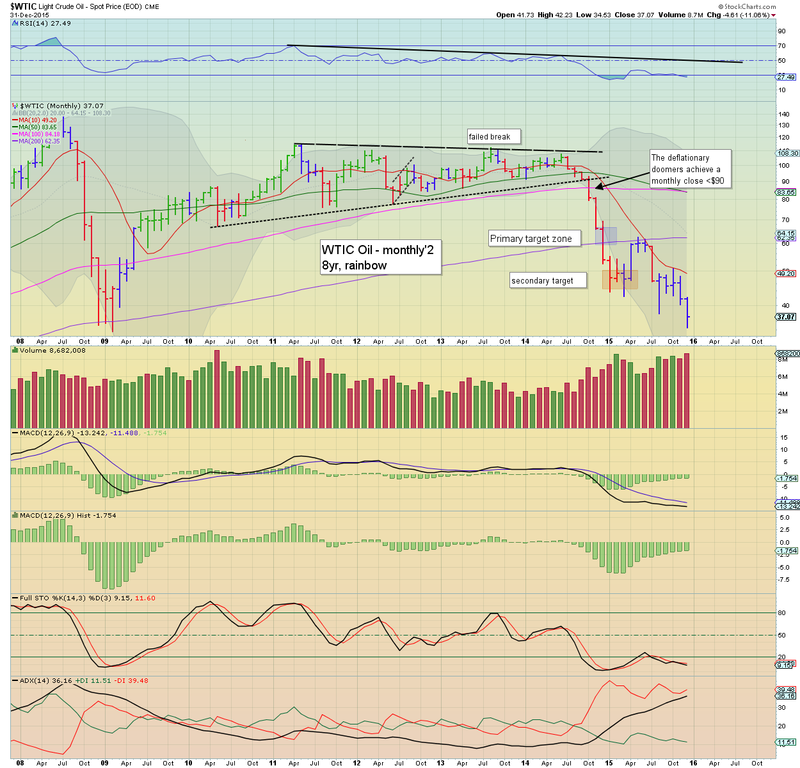 *the weekend post will be on the world monthly indexes, and will deal with the net monthly/yearly changes. **I will post my outlook for 2016 - along with collated predictions from YOU, next Monday evening. 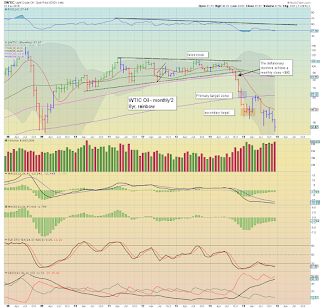 US equities closed the year on a pretty bearish note, sp -19pts @ 2043. The two leaders - Trans/R2K, settled lower by -0.4% and -1.2% respectively. 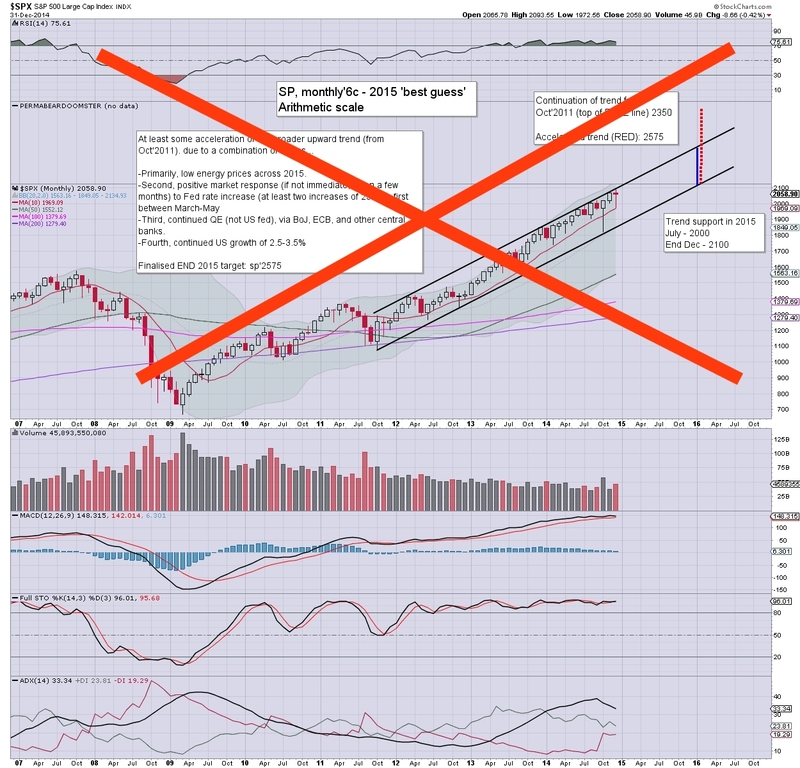 The year end close for four of six US indexes was below the monthly 10MA, and that sure bodes in favour of the bears for early 2016. 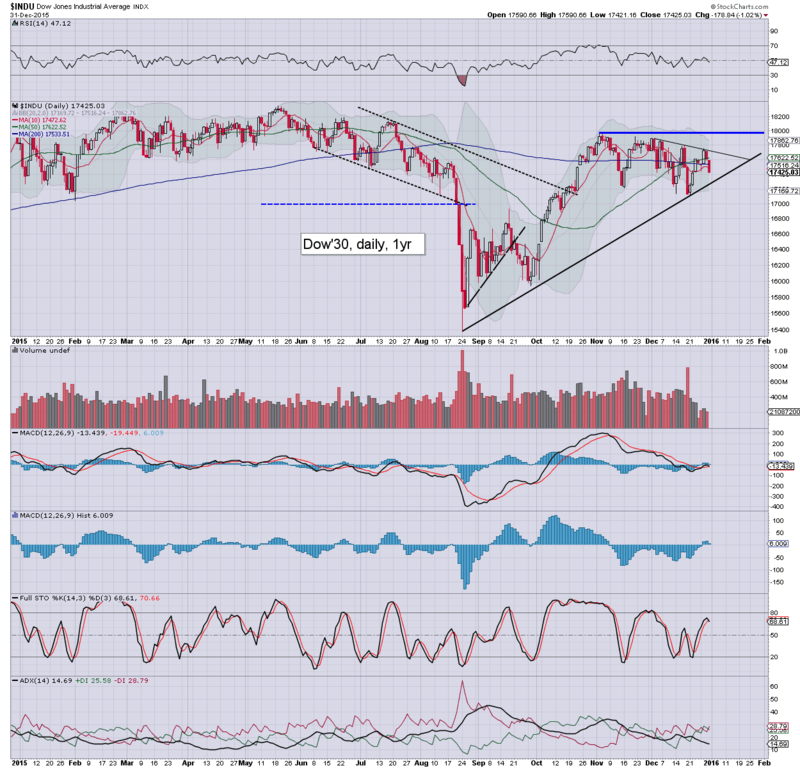 Unquestionably.. the short 4 day week ended on a bearish note, with all indexes on the slide. There is certainly opportunity for upside into mid January, but right now, the notion of new historic highs in any of the headline indexes (Dow, sp', Nasdaq) look out of range in the near term. 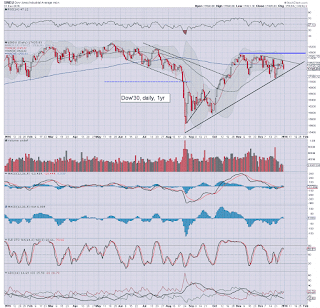 For the moment... the broader trend is turning rather bearish indeed, but more on that... in a later post. At 11pm EST, my review on the predictions for 2015 that some of you contributed.